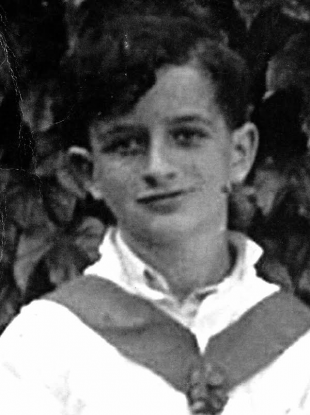 Jimmy O'Neill was aged 12 or 13 in this photograph was taken during his altar-serving days at the Dominican Church on Bridge Street, Waterford city. THE BROTHER OF a Waterford boy who went missing in December 1947, aged 16, has not given up hope that Ireland’s longest missing persons case could yet be solved. Frank ‘Frankie’ O’Neill, who has lived at his Leamy Street home in the city his entire life, spoke movingly of his decades-long search for information about his elder brother Jimmy, who was working for the Clyde Shipping Company at the time of his disappearance. Frank was aged just four when Jimmy, born on Morgan Street in 1931, went missing on 15 December 1947. Well, we just don’t know. All these years later, and it’ll be 69 years in December, we have no idea. “Given that he worked for Clyde Shipping, we’ve long suspected that Jimmy must have left Waterford on board a ship, be it to Liverpool or elsewhere. He must have built up some contacts and friendships during his time working there and if he did stow away, wherever he disembarked, he must have been given some direction or leeway about where to go. Frank admits he has carried around the question of Jimmy’s whereabouts “every day of my life”. “I’m all my life trying to get a lead or to establish something about what happened to Jimmy, but this is something I’ve failed to do over all of these years. It’s led me to make enquiries across many different countries – be it Australia, New Zealand and South Africa, but I’ve never made a breakthrough. Ever since my school days in Mount Sion, when I’d the brothers up there asking me about Jimmy, I’ve never given up the hope of finding out what happened to him. And it’s been very, very hard to live with, over all that time. Where did Jimmy go? Frank, who provided a DNA sample just over three years ago in the hope that it might lead to a long-overdue breakthrough in the case, has no memory of his older brother. “I grew up with hardship; my mother crying going down the town; people asking was there any news about the nipper; Christmas time; the anniversary; the nuns coming up to the house on Leamy Street every Sunday; so many questions and a great deal of sadness. Sport, and hurling in particular, was my escape from that sadness and the unanswered questions about Jimmy. “On my mother Bridie’s deathbed in 1974, a nurse told me she’d been calling for Jimmy all night in the house before she died, and to be told that was absolutely heartbreaking – my father, Jim Senior, passed away in 1966, and the trauma of Jimmy’s disappearance left a huge mark on both of them. Email “A devastating mystery: 'Here I am, a man in my 70s, wondering what became of my brother'”. Feedback on “A devastating mystery: 'Here I am, a man in my 70s, wondering what became of my brother'”.